On 5th March 1984 began one of the most important, pivotal episodes in the 20th century UK political timeline – the 1984-1985 Miner’s Strike. 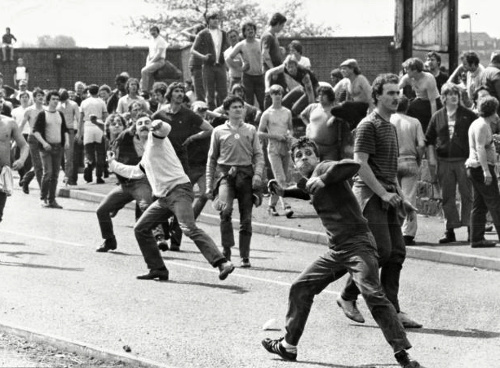 This was a bitter, year-long dispute, pitting Arthur Scargill’s National Union of Mineworkers against the Conservative government led by Margaret Thatcher. Ostensibly a dispute over the closing of uneconomic mines, in reality far more was at stake. This was the rule of the mob against the rule of law; militant trade unionism against the primacy of democracy. The government had been elected by a huge majority only a few months previously; in contrast the Union which tried to overcome it had not even balloted its own members to seek a mandate for its action. The union barons had grown accustomed to wielding the power of veto over the democratic franchise, bringing down government after government by inflicting power cuts and industrial disruption until the electors had had enough. But they had picked a fight too far, this time. Scargill had underestimated the reserves of coal in the power stations, had underestimated the reluctance of key sections of the mining industry to strike without a ballot, and perhaps most critically, had underestimated the resolve of Margaret Thatcher’s government to defeat him. She knew that this was a contest the British People could not afford to lose. A year later, we had won, and the political landscape was transformed. The hard left unions had been neutered. Their corrosive capacity to disrupt British industry and send jobs abroad, as they had done to such devastating effect in the ’60s and ’70s, was greatly diminished. And they had forever lost their power to superimpose their own hard left agenda over the people’s choice of government. Spare a thought today for David Wilkie, a Welsh taxi driver killed by striking miners for taking one of their colleagues to work.